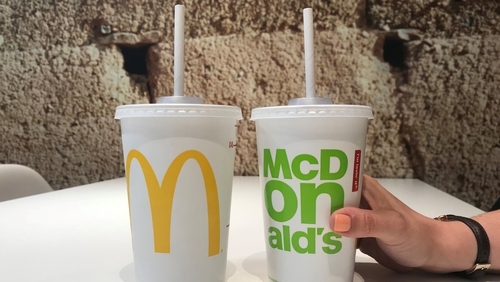 McDonald's is to replace plastic straws with paper ones across all its outlets in Ireland and the UK after a successful trial. A roll-out of paper straws in all 1,361 restaurants will begin in September, with the process to be completed next year. McDonald's said it had found two suppliers to meet its needs for paper straws - a global company called Huhtamaki, which has a production plant in Belfast, and Welsh start-up Transcend Packaging. McDonald's has already taken steps in all of its restaurants in Ireland and the UK to put plastic straws behind the counter to reduce waste. The company is the latest to ditch plastic straws, with businesses including Burger King, Costa Coffee, Wagamama and pub chain JD Wetherspoon all making the move away from them. Paul Pomroy, chief executive of McDonald's UK and Ireland, said: "Reflecting the broader public debate, our customers told us they wanted to see a move on straws but to do so without compromising their overall experience when visiting our restaurants. "Over the past few months we've been working closely with supplier partners to find a solution that works both for our customers, and that the supply is there given the size of our business. "The [British] government's ambitious plans, combined with strong customer opinion, has helped to accelerate the move away from plastic and I'm proud that we've been able to play our part in helping to achieve this societal change." Francesca DeBiase, executive vice president, global supply chain and sustainability, said: "McDonald's is committed to using our scale for good and working to find sustainable solutions for plastic straws globally.